Our beautiful frilled all in one’s are made from 100% linen and are a sustainable luxury product. The gentle gathers to the sides and the detailed shoulders take our seamstresses much time to perfect. Designed to be worn all year round, Freya Lillie creates each piece slightly larger. This enables the item to be worn all year round, whatever the season. We have many customers worldwide who can vouch for this too. Once it no longer fits, it can be put away or be passed on and on. 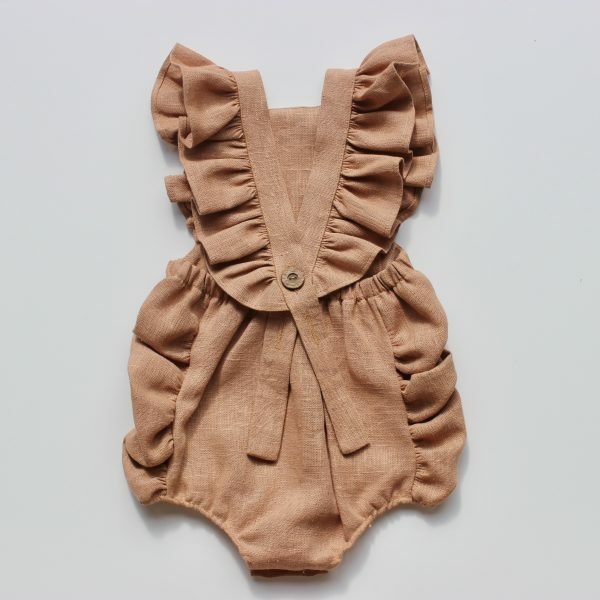 Freya Lillie is a sustainable luxury baby brand. Using 100% linen and organic cotton with everything made in England. We don’t use plastic and always use recycled packaging because we know at some point, we all need to start caring about our planet as there is no planet B. We choose to use 100% linen for our clothing because not only is it sustainable, it’s the most luxurious in the way it was formed. It’s more durable than most other materials which is important when it comes to children, don’t be afraid of it, embrace it and let kids be kids. As we are a sustainable fashion brand, we design and size our children’s clothing to last. This means they are made with room to grow and are a generous fit. Our pieces have adjustable button holes which mean they will last throughout the year. They are not just for Summer, they are key pieces designed to be worn all year. Team with knits come the cooler months and on it’s own in the Summer. Our overalls are oversized and we advise that you purchase the size below if you prefer a more fitted look. Don’t worry as we offer returns and exchanges if you aren’t completely satisfied. Please see our size chart for further details.